We should all wink at the world a bit more often don’t you think? With this #rootd you can flirt your heart out and wink away. A great look that can take straight from the barn to laté’s with the girls in town. Chiara Ferragni is a blogger, an iconic Instagram personality and model that has thankfully given the world her line of ‘Flirt’ clothing and accessories, check out this super cute t shirt and phone case, which you can get on chiaraferragnicollection.com. 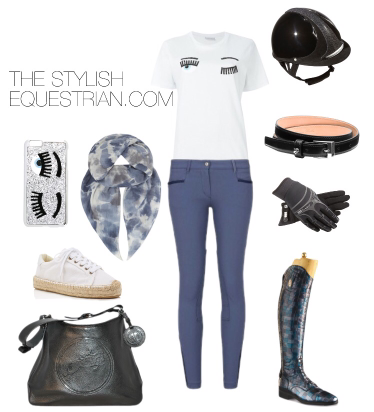 Combine your flirty wink shirt with a pair of Dada Sport breeches and class it up with some black and blue accessories, like the Antares helmet, Miasuki belt, ssg gloves and the exceptional Stivaleria Secchiari custom boots. Change your boots for some super comfy and stylish Soludos espadrilles, throw on a Saint Laurent scarf and grab your Tucker Tweed bag to hit the town with the ladies.